Spending about three-quarters of 2011 in Thailand, I was able to explore further the glorious realm of delicious Thai food. #1. 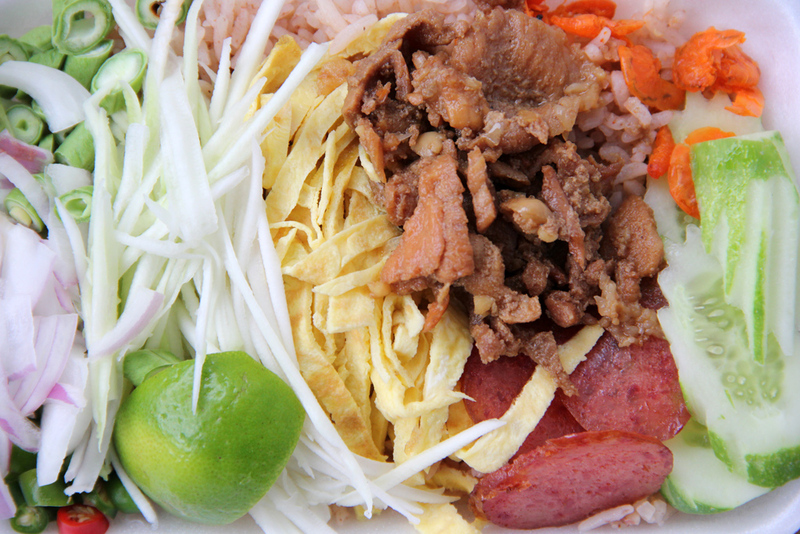 Pictured above is a dish known as khao kluk kaphi that is made of shrimp flavored fried rice covered in a rainbow of tasty ingredients! #2. 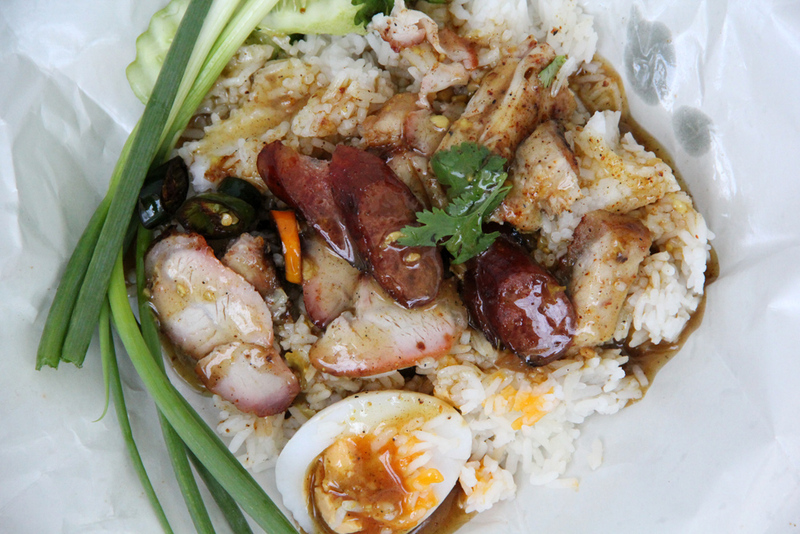 Khao moo daeng, or red barbecued pork and rice, is a pork lovers dream come true. This is a very common dish in Thailand, but after seeing the crowds at this particular restaurant, I decided to give it a try – and it was the best one I've ever had! #3. I'm a huge lover of all Thai food, but nothing gets me more excited than southern Thai food and its wonderful blend of spicy curries. Shrimp fried with string beans and something known as “stink beans” was one of the dishes that I couldn't get enough of in 2011. #4. 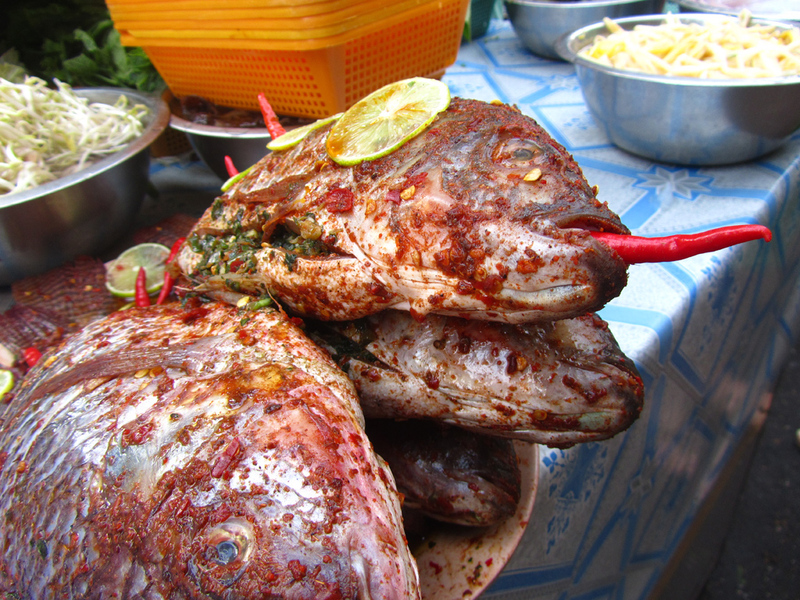 When I saw these fish waiting to be grilled on the street side of Yangon, Myanmar, there was nothing I could do but immediately order one. Covered in chili paste and stuffed with fragrant herbs, it was possibly the best grilled fish I ate the entire year. #5. 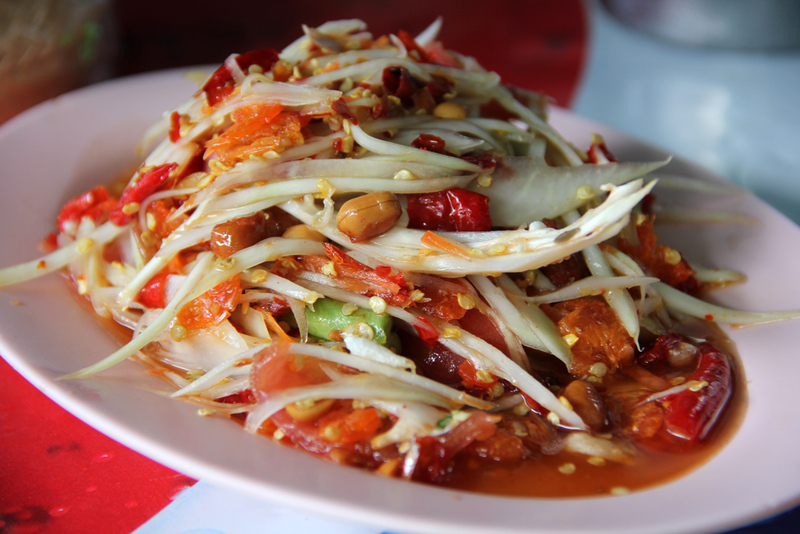 No trip to Laos would be the same without spicy green papaya salad, known as som tam. A combination of shredded crisp green papaya, chopped string beans, tomatoes, dried shrimp and peanuts dressed with fish sauce and lime and served with sticky rice is hard to beat. 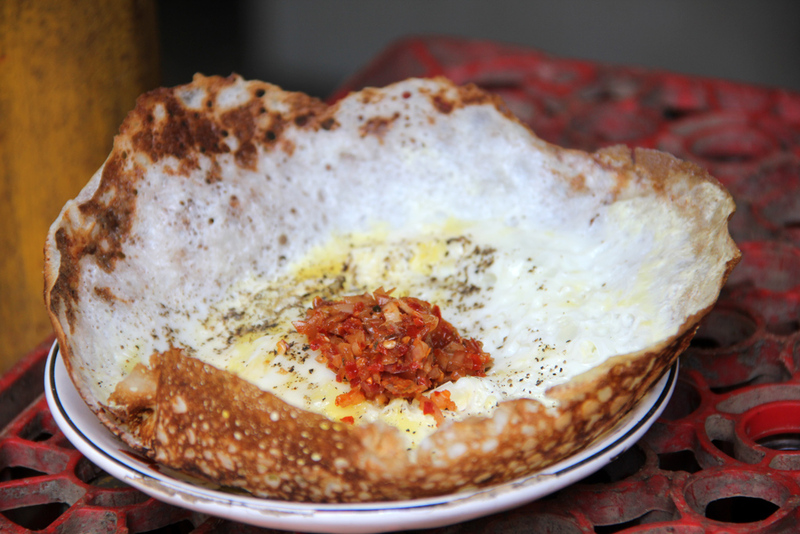 They are made from pancake like batter, flavored with coconut milk, cooked with an egg on top, and served with delicious onion and chili sauce. #7. 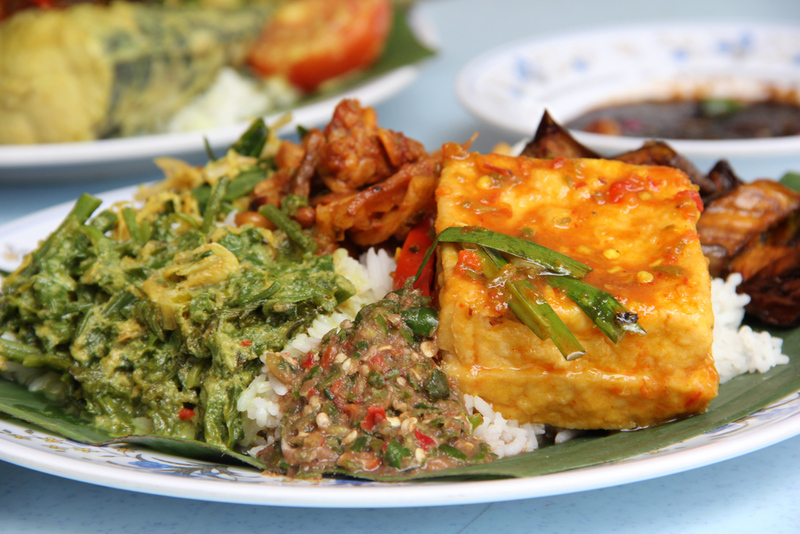 Malaysian food is so good that I'm willing to make a trip to the country exclusively for a feast. This plate of nasi campur, rice with mixed toppings, is one of my favorites. 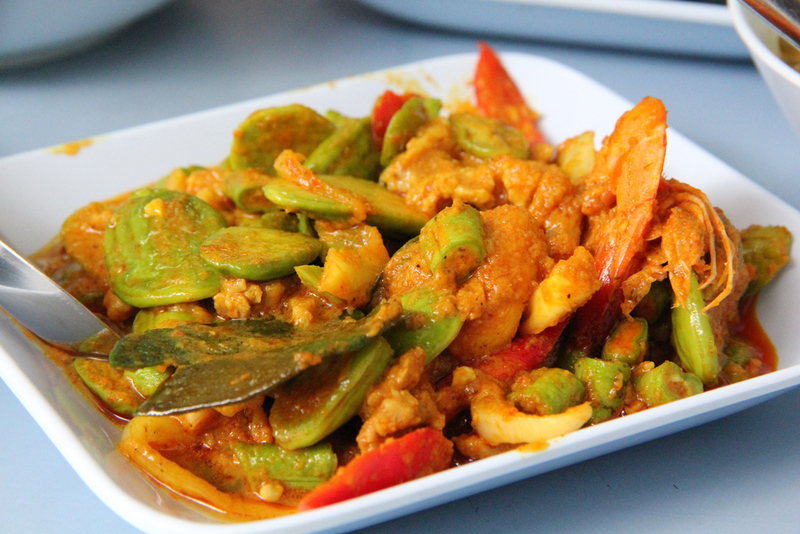 The intense flavors and chillies were absolutely delightful. #8. As a half Chinese American myself, I grew up eating Chinese food on the daily and there's no other form of cuisine that is more comforting to my taste buds. 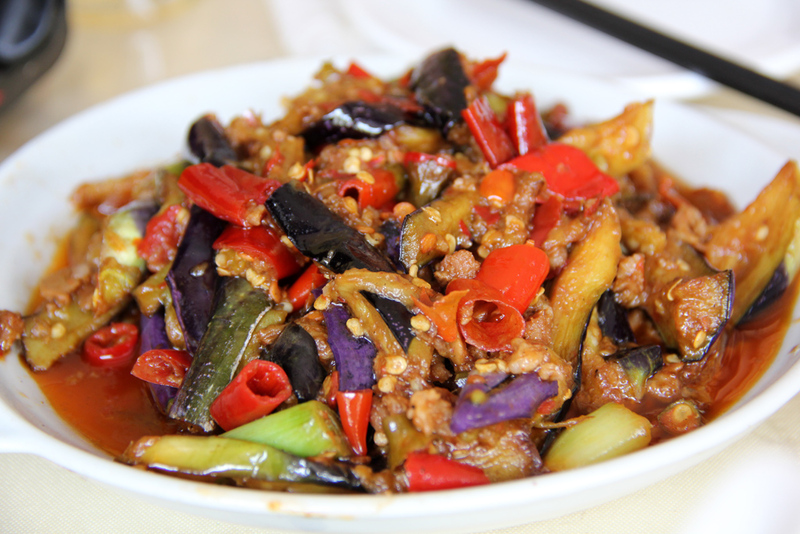 This plate of eggplant with pork and chillies was outstanding! #9. Now I'm typically an every-meal-rice man, but when noodles are covered with this array of gorgeous toppings, they can be irresistible. 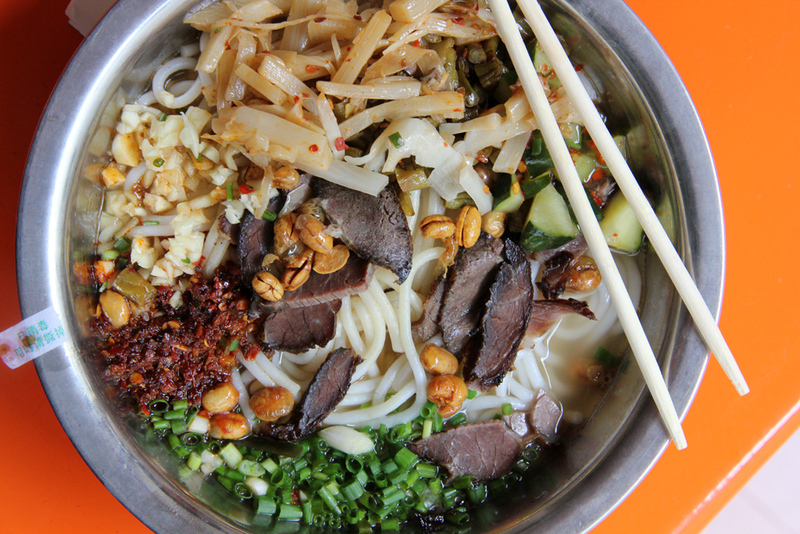 I enjoyed every slurp of this bowl of noodles in Yangshuo, China. #10. 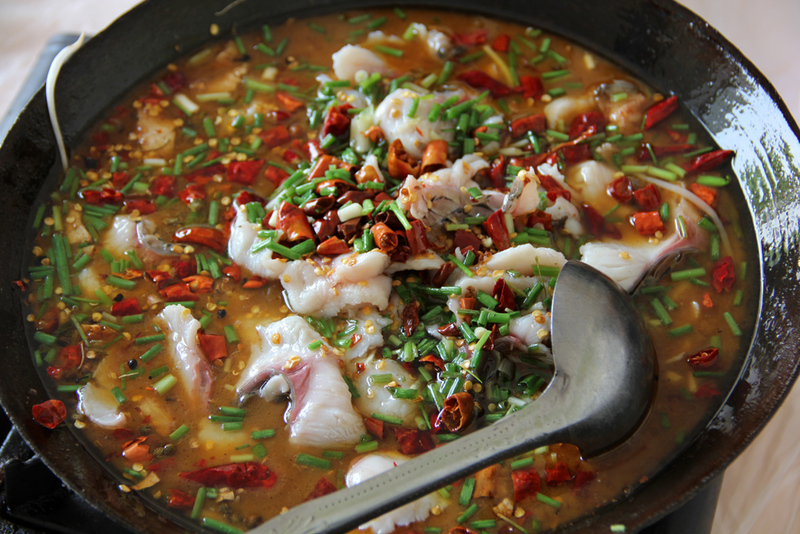 The ultimate meal that changed my life for the better in 2011 was this Chinese hot pot of white meat fish smothered in a seemingly infinite amount of garlic, dried chillies, and Sichuan mouth numbing peppercorns. With a few bowls of rice, this was probably my most memorable meal of the year! Nice dishes . Thai food are really delicious.